Their reply was that they do not offer adoption referrals or services. Zero assistance was additionally offered. Prenatal Care? Not at Planned Parenthood Reading. Earlier this year, Planned Parenthood Reading was caught advertising prenatal services to women when in fact not one location provided such services. Pennsylvania Family Institute found out that not only Planned Parenthood Reading but every Planned Parenthood facility in the state did not offer prenatal care, yet each of these facilities listed “prenatal” as a service on their website. When this was uncovered, they removed the ‘prenatal’ listing from their website. The Reading School District is close to voting on a proposal that would allow Planned Parenthood staff directly into the high school. If a teenage girl from Reading is pregnant and contacts this Planned Parenthood facility for help, she will find that not only will there be no adoption services but she will not even be offered an adoption referral. If she asks about prenatal care, she will find no help from Planned Parenthood. But she can find assistance for an abortion and Planned Parenthood Reading makes $450 – $540 for each abortion performed. Their facility alone performs nearly 1,000 abortions every year. Planned Parenthood Keystone, the region this Reading facility is a part of, produces an annual report that highlights their services. They report to seeing nearly 40,000 patients and performing over 4,000 abortions but not once do they mention adoption referrals. 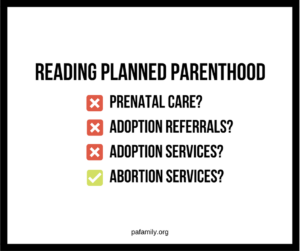 Planned Parenthood Reading’s direct profit from abortion and their lack of options provided for pregnant teens makes them unfit for direct involvement in Reading High School or any school in the Reading community. that is absolutely disgusting and horrifying. THANK YOU PA fam. Institute for doing your homework and investigating this Planned Parenthood false advertising issue. I suggest the PA fam. Institute contact pro life folks in the Reading area to encourage them (including pastors) to talk to school board members about this false advertising, and troublesome plan to allow Planned P. in the public schools.